North Shore Scape, 8 x 8 inches, Wood Frame, 65.00. Cathedral, River Road, 8 x 6 inches, Wood Frame, 45.00. Cathedral, River Road Triptych, 15 x 7 inches, 85.00. Birch Tree Composition, 15 x 7 inches, Wood Frame, 85.00. Tide Pools, 8 x 8 inch Wood Frame, 65.00. Plum Island Stroll, 8 x 8 inches, sliver frame, 65.00. Cathedral, River Road, 8 x 8 inches, 65.00. Rocks and Water as Metaphor for Life’s Journey, 8 x 8 inches, 65.00. Pink Cutting Garden, 8 x 8 inch Wood Frame, 65.00. Sea Roses, 8 x 8 inch White Frame, 65.00. Hydrangeas, 8 x 8 inch Wood Frame, 65.00. Shimmering Pond, 8 x 8 inch Wood Frame, 65.00. Atlantic Palette, 8 x 8 inch White Frame, 65.00. Bending Reeds, 8 x 8 inches, Silver Frame, 65.00. Atlantic Palette, 8 x 8 inch Wood Frame, 65.00. Marblehead Harbor, 8 x 8 inch Wood Frame, 65.00. Crashing Waves, 8 x 8 inch Silver Frame, 65.00. Four panel Crashing Waves, 8 x 6 inch Frame, 45.00. Red Cutting Garden 8 x 6 inch Wood Frame, 45.00. Red Cutting Garden, 8 x 8 inch Wood Frame, 65.00. Tide Pool, 8 x 8 inch Wood Frame, 65.00. River Road, 8 x 6 inch Frame, 45.00. Shimmering Pond, 8 x 6 inch Frame, 45.00. Boston Public Garden 8 x 6 inch Wood Frame, 45.00. Bending Reeds, 5 x 5 inch Wood Frame, 25.00. Autumn Marsh, 8 x 6 White Frame, 45.00. Castle Garden, 8 x 6 inch Wood Frame, 45.00. Sail Boats, 8 x 6 inch Wood Frame, 45.00. Castle Garden, 8 x 6 inch Black Frame, 45.00. Sailing Boats, 8 x 6 inch Wood Frame, 45.00. Shimmering Pond, 5 x 5 inch Wood Frame, 25.00. Castle Garden, 5 x 5 inch Black Frame, 25.00. Red Cutting Garden, 5 x 5 inch Black Frame, 25.00. Sail Boats, 5 x 5 inch Wood Frame, 25.00. Sail Boat Triptych II, 15 x 7 inches, 85.00. 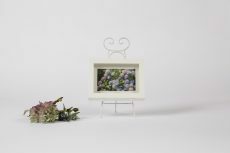 Cutting Garden Triptych, 15 x 7 inch Frame, 85.00. Autumn Marsh Triptych, 15 x 7 inch Black Frame, 85.00. Shimmering Pond Abstract, 8 x 8 inch Wood Frame, 65.00. Boston Public Garden, 24 x 18 inch Custom Frame, 250.00. Sail Boat Triptych, 16 x 10 inch Custom Frame, 85.00. These small scale custom framed limited editions are printed on William Turner Watercolor paper, hand watercolored and signed by the artist. Perfect for small corners in a home or office that needs a special touch. Ideal for house warming, birthday, or holiday gift giving.